Ingo Meller was born in 1955 in Cologne, Germany and continues to live and work there. He studied at the Fachhochschule in Cologne between 1976 and 1980 and has exhibited extensively in Europe and the United States since 1985. First brought to wide public attention in 1987 by his participation in the exhibition "Kunstforum no. 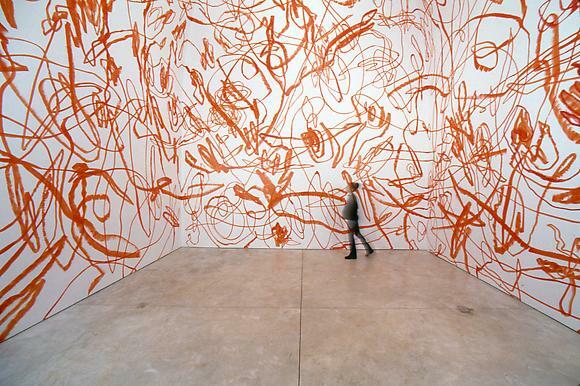 88", subtitled "Radical Painting", the artist remains committed to the painting medium. Working in a style that combines predetermined constants with brushwork that suggests Abstract Expressionism, Meller unites two opposing currents to form a unique painting style. The artist begins his compositions with constants defined by traditional, painterly means. He uses unprimed, unstretched canvas cut along the thread. The surface of the painting is a rectangle defined by the structure of the canvas. Using one brush for each stroke on the canvas, Meller allows the brush to determine the form of the applied paint. Each brushstroke is not only identical with its own breadth and length, but retains the character of the movement that produced it. By using only ready-made, unmixed paints, the artist does not assign any meaning to individual hues. Color thus becomes object as paint and color achieve congruence. "…these oppositions, similarities, degrees, form a network of relationships – a structure – which lends coherence to the painting. Structure results from the construction, organization or arrangement of parts into a whole…it emerges from activity, from the constant friction between constants and variables. In Ingo Meller's art the two are coordinated, generating a conscious experience of perception." "A line drawn by Otto Zitko when he paints continues the line which the artist began a long time ago. It is the line which accompanies him 'on the road' as an artist following nomadic principles, as an artist who literally drafts a path in maze-like networks and then pursues it (or proceeds first and then re-traces his steps), as an artist who places two-dimensional lines in existing spaces with space-occupying gestures of painting/drawing, thus giving the spaces dynamism, removing their boundaries and enriching them by undreamt-of depth which hints at the dimension of time."